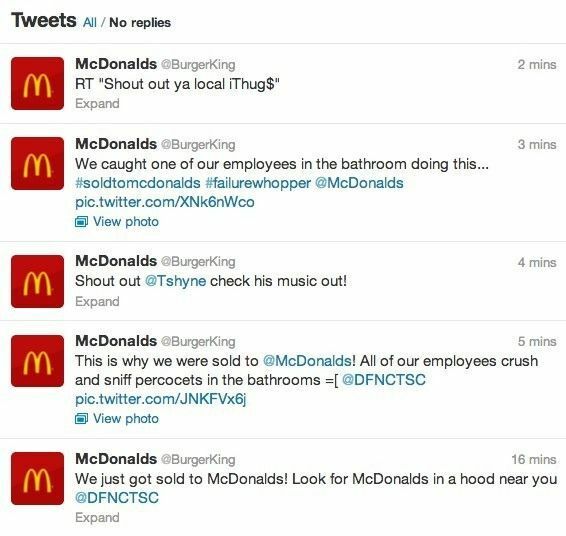 Hackers took over Burger King’s Twitter account on Monday. 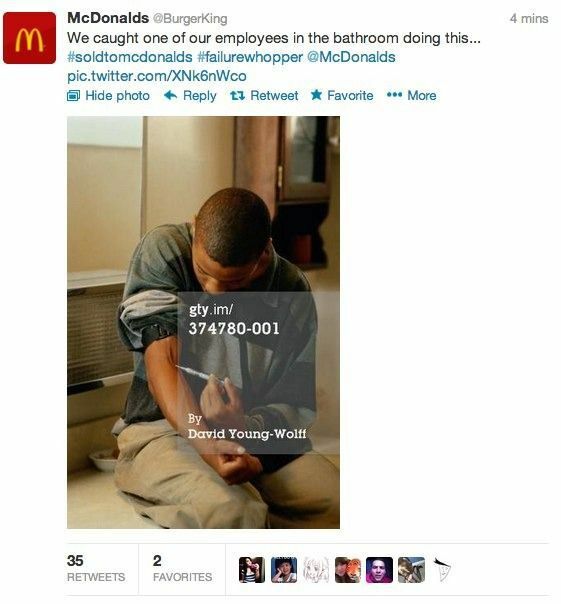 The cyber tricksters changed the fast food company’s avatar and name to “McDonalds” and sent a McFlurry of questionable and offensive tweets. 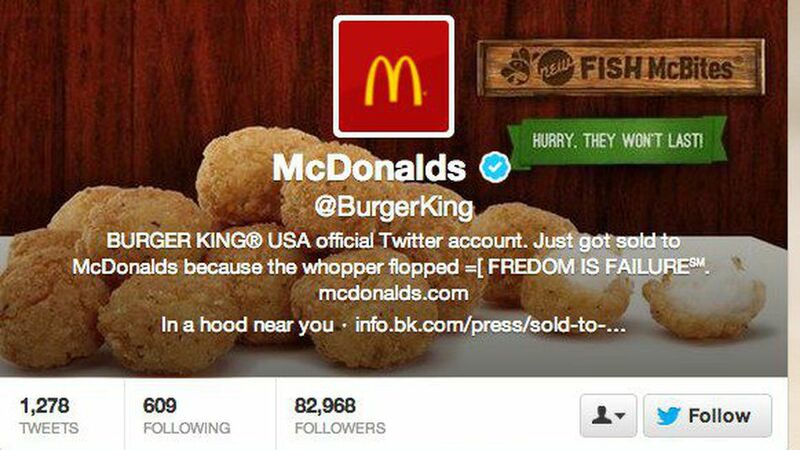 The Twitter mishap isn’t all bad news for Burger King though — the account added 5,000 new followers in the first 30 minutes since the hackers took over. Mashable has reached out to the company and will update this post with any response. UPDATE : As of 1:15 p.m. EST, it appears Twitter has suspended the @BurgerKing account. Who’s suing whom in the mobile industry? It can be a tough question to answer, even if you’re closely following all the lawsuits that have been thrown around in the last couple of years. Nokia sued Apple and vice versa, with both companies claiming the other was infringing on its patents. Both companies have also slapped other companies with lawsuits, again mostly over patent infringement or price fixing. Add other IT giants, such as Kodak, RIM, HTC, Google (Google), Sony Ericcson and LG into the mix, and soon it’ll feel like everyone is suing everyone else. Nokia sued Apple and vice versa, with both companies claiming the other was infringing on its patents. 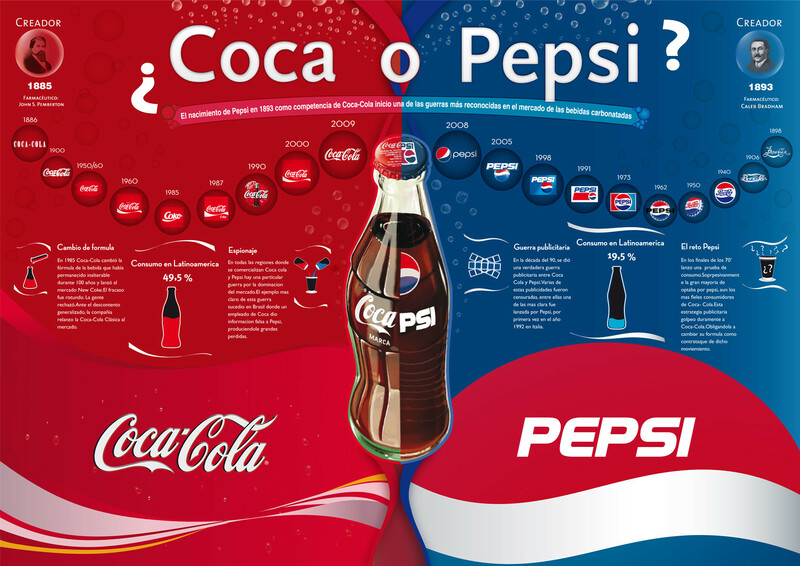 Both companies have also slapped other companies with lawsuits, again mostly over patent infringement or price fixing. Add other IT giants, such as Kodak, RIM, HTC, Google ( ), Sony Ericcson and LG into the mix, and soon it’ll feel like everyone is suing everyone else. Quick Pitch: Sparrow is a minimalist mail application for Mac. It was designed to keep things simple and efficient. No fancy stuff here — just your mail and nothing else. Genius Idea: E-mail has become such a large part of our lives that everyone from Google (Google) to individual developers are looking to build the best solution for faster, better e-mail management. Yet all of the bright new features sometimes make our e-mail inboxes more complex (and sometimes slower) than ever. But not Sparrow. The free Mac desktop client for Gmail (Gmail) approaches e-mail with Tweetie (tweetie)-like finesse and simplicity. If anything, Sparrow feels like a mobile e-mail client optimized for your desktop, which means it eliminates the chaff to focus on the wheat: exchanging e-mail. Genius Idea: E-mail has become such a large part of our lives that everyone from Google ( ) to individual developers are looking to build the best solution for faster, better e-mail management. Yet all of the bright new features sometimes make our e-mail inboxes more complex (and sometimes slower) than ever. But not Sparrow. According to data from StatCounter, Internet Explorer has dipped below the 50%-mark in its global share of the Internet browser market. StatCounter shows IE at 51.34% of the market in August 2010; by the end of September, IE was holding on to just 49.87% of the browser market. The browser also shows a drop of nearly 10% year over year. During the same month that IE sank to its all-time low, Firefox grew by about half a percent to 31.5%, while Chrome added almost a full percentage point to its share of the market. These losses come in the face of steady growth from Firefox ( ) over the past several years and speedy gains by Chrome ( ) in recent months. Gmail can be tweaked almost endlessly with various Firefox and Chrome extensions, and offers some pretty nifty Labs options too. However, we’ve taken a look at some simple tips, tricks, tweaks and shortcuts you can use without going down the plugin or experimental route. These 10 features will help you get so much more out of the webmail service, from an enhanced chat experience, to smarter filters, to offline access. Have a read through now and let us know any neat Gmail (Gmail) hints you’d like to share in the comments box below. Have a read through now and let us know any neat Gmail ( ) hints you’d like to share in the comments box below. Gmail’s instant messaging Chat function is one of the more basic options around, but there are a few bits of formatting you can use to add nuance to your online communication. You’ve no doubt noticed the “Web Clips” line of text that appears above your Gmail inbox which contains news, blog posts, ads and other info. But did you know you can personalize it to make it more relevant to you? Simply go to “Settings” on the top right of your screen and select the “Web Clips” tab. From there, you can search, browse from the categories, and add and remove items to your heart’s content. The mobile voice over IP (VoIP) service Fring now allows its users to make phone calls to land line and cell phone numbers anywhere in the world with prices starting at one cent per minute. Not all calls will be that cheap. Calls to Canada start at 0.4 cents per minute, and calls to India start at 1.1 cents, for example. But it’s more competition in a very small space currently dominated by Skype and to a lesser extent Google Voice. You used to be able to make Skype calls using the Fring applications for mobile phones like the iPhone and Android devices, but following the launch of the iPhone 4, Skype and Fring got in a bit of a scuffle and Fring users were left in the cold — no Skype access. Rather than bridge the gap between the two services, Fring has opted to launch its own service to connect its users with outside phone lines. That service is called fringOut, and it’s hard to miss that it sounds a lot like Skype’s own service for that purpose, SkypeOut. Advancements in mobile phone location technology not only allow for automatic background location behaviors, but also facilitate real-time, private location sharing for more practical purposes of a personal variety. Geofencing technology powers most of these features — a geofence is nothing more than a virtual perimeter for a geographic area. Simply put, newer location-based applications enable users to build virtual fences around areas of interest. Those fences can be static or dynamic in nature, and possess properties that trigger behaviors such as notifications and automatic location updates upon zone entry or exit. In Neer, geofencing is used behind-the-scenes to update a user’s whereabouts and trigger follow-up behaviors. When a Neer user enters or leaves a pre-defined, geofenced region, the application will update accordingly. Friends and family will receive automatic notifications, should the user so specify. Geoloqi offers another approach to private location-sharing. The full-featured mobile and web platform also taps into to geofencing technology so users can leave themselves geo-located notes and perform time-saving automatic location-specific activities — think sending and receiving SMS messages when you enter or leave designated areas. These private location-sharing activities could come in handy if you want to automatically notify a friend that you’re on your way to their house, or auto-email your boss that you’re running late. The service is currently limited to beta testers, but it certainly highlights the practical potential of background location for personal and peer-to-peer use. As Facebook enters into the location market with Facebook Places, the world’s largest social network will help to make the edgy concept of checkins and location-sharing a mainstream practice. Facebook ( ) is just one company attempting to add location for context; there are countless others going above and beyond checkins to push the space forward. There’s also a noticeable uptick in consumer interest around applications and services that feature location for sharing or utility.